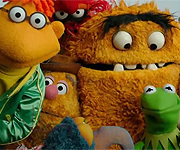 This is a thread where you state what's most on the minds of muppet fans, here are a few of my thoughts. If Constantine will be used in the future. There are so many Muppet productions and things Disney owns what are they going to do with them all? Why, whenever I write for Fleet Scribbler, I always hear him speaking with Moe Syszlak's voice. That, and when they're going to put seasons 4 and 5 on DVD. What will ever happen to the Muppet Babies? Will we ever see Skeeter with the Muppet Show Muppets? I wish any of the record stores here carried used Muppets albums... singles even! What exactly is Walter's role, and where/how does he fit in with the Muppets? I had thought that MMW would start to answer that question, but it really didn't. cahuenga, Muppet Master and muppetlover123 like this. obviously im wondering about series 4 and 5 but im also wondering if we'll ever see a new series of action figures or somthing along those lines. DrDientes and muppetlover123 like this. Will an Electric Mayhem album ever be released? LaniArianna, AlittleMayhem, LipsGF4Life and 2 others like this. Will the Electric Mayhem ever come to Ohio? LaniArianna and misspiggy5260 like this. Will there ever be a Muppet Show reunion where some of the guest stars ( who are still living) come on stage and speak about The Muppets, then do a number with them? that's a brilliant idea, what guests did you have in mind? Any of them that hopefully made it through these years!! yeah i supose, we have lost a few along the way, that and some of them are a little too old to do it sadly, but id still like to see joel grey back again should somthing like a reunion of sorts happen. What's often on my mind? What articles I intend to write for The Muppet Mindset. I just wish that Lips could speak more and feature in more scenes in Muppet movies or specials on TV. That would definetly make my day. 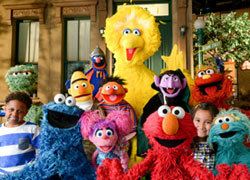 When I saw the title of this thread, I heard Elmo saying, "Guess what Muppet fans are thinking of today? Da-da-da-da!" When it comes to Sesame Street, besides what I said in previous posts, I'm often thinking about Out to Lunch, Christmas Eve on Sesame Street, Follow That Bird, early video releases (from 1986-1991), Sesame Street News (in fact I'm often thinking about Kermit's Sesame Street appearances), Super Grover, Waiter Grover, Monsterpiece Theater, Miami Mice, Sesame Street: 20 and Still Counting, and Sesame Street All-Star 25th Birthday: Stars and Street Forever. Bliffenstimmers and LipsGF4Life like this. DrDientes, TheWeirdoGirl and LipsGF4Life like this.